Currently have a Leupold tbr 1200. Has worked great ranging out to 800 yards. Last week i was hoping to get close to 1,000 but was limited to the rangefinder so now i am thinking it’s time to upgrade. The sig 2200 bdx has caught my eye. Seems like it would get me to the max distance i plan on ever shooting - 1200 ish yards. I think the Bluetooth capability would be a cool feature for quick adjustments displayed in the reticle but i have read that this is limited to 800 yards. This isn’t a huge deal i guess because at that point i could use an app like ballistic ae or something. Am i missing a better option in the $500 range?? I have compared the prices and you can find them for close to the same price at times. Anyway just wanted to throw this video out there as an option. Sig is an amazing RF. For $500, you have your choice of Leica 1600-R ($399), 2000-B ($429), or 2400-R ($499). I sold my leica a few years ago after touching a kilo off outside in bright light at nearly 2k yards. It did in tough conditions what my leica couldn't do in the best conditions. The optics are no comparison, but it's plenty for what I do.....coyotes to 1500. I have the 2400 bdx that I bought about a month ago for the bluetooth ability and so it could sync with the Kestrel. Midway had these one sale for around $600 so it is a step up from your original $500 but if you ever think you will get a Kestrel in the future it might be worth looking at when they go on sale again. If you are ready to buy now, then Midway has a blemished 2200bdx on sale at $320 which is a nice discount from the $500. I haven't played with mine a whole lot yet, but so far I like it. Seems like a good way to avoid needing to consult a dope chart or app elsewhere before you can shoot in a hunting situation. That is the Cabelas add above and it is slightly different than the standard kilo 2200bdx. 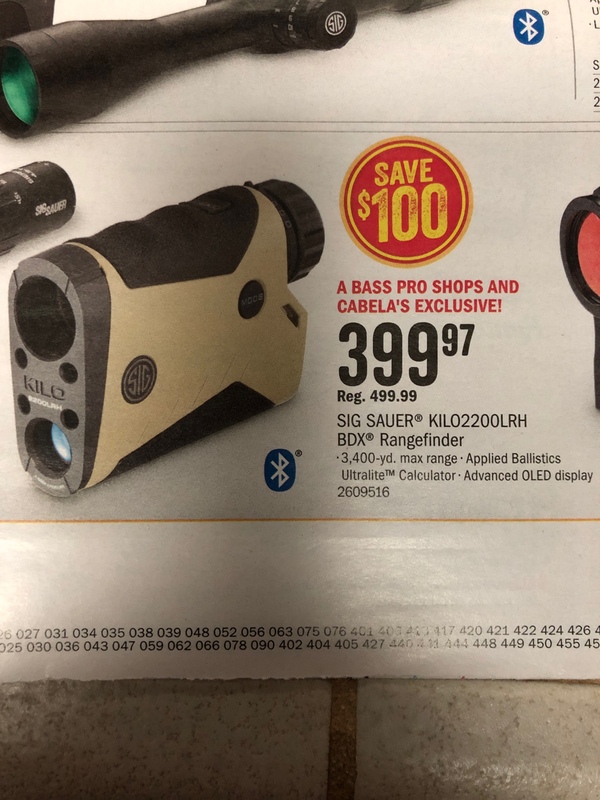 I did some research when I first started looking at them and the Cabelas version does not have the auto brightness feature. You can set the display brightness, but it doesn't automatically adjust like the standard bdx does. I also forget if it has a different reticle or not, but the brightness feature alone made it worth buying the non Cabelas model. As a coincidence, Midway had a big sale on all the Sig Rangefinders that started today. You can find the 2200 at the same Cabelas sale price of $400, or get the 2400bdx for $600. I didn't realize that the standard 2200bdx came with applied ballistics ultralight as well. Seems like a good deal! I just saw this. Been working on a review of the BDX scope/integration, but have some up on the two Leica B model CRF's, and also the 2400 BDX on this board. Read through if you like and perhaps will answer your questions on the functions and differences. But to answer generally, the 2200 does have AB Ultralite onboard. It does not have onboard environmentals, but when connected to a phone, it will automatically pull that from the nearest station, or if there is no cell service, you can set environmentals manually. You can also load a custom curve from the phone to your RF, which is what Ultralite uses to calculate your solution. However, ultralite differs from AB elite in that it does not use CDM's, but G7's, and it does not calculate coriolis, spin drift, aero jump etc...into it's ballistic returns. Consequently, it is limited to 800 yards for a ballistic solution. If you step up to the 2400, it's pretty much the same, except it adds connectivity capabilities to a Kestrel 5700 or Foretrex 701 running AB Elite. In that case, when they are connected, the external device does all the solution calculation and then displays your solution back into the RF pretty seemlessly. In the price range you have stated, ie $500, I'd say try and add a bit and pick up the 2400 if you plan to shoot long. The downside to that is that you still would need a Kestrel if you want the whole thing to be seemless, but for shooting long, it's worth it IMO. And you could make that purchase when you are ready, does not have to be immediate. The other alternative is the 2400 ABS which sometimes can be found for the 8-900 range. But you have to be on the lookout. In that case, AB Elite is integrated as are environmentals, but you have to make that purchase all at once and there is no connectivity with the scope. BTW, the scope connectivity, in our tests so far, has been excellent, very fast, and good to the 700 we were able to try it out to. HTH, if you have any questions on these, feel free to reach out if I can be of help.